Over the winter it was an easy decision to buy a gun for high country small game backpack hunting. Grouse are phenomenally tasty birds, especially the pheasant-sized Dusky or Blue Grouse. Ideal grouse habitat, especially Dusky habitat, tends to be not close to the road. My main field shotgun is light for what it is, but at six pounds is a not inconsequential load. It’s also pretty enough that part of me hesitates to let it sit under a tarp overnight collecting condensation and sand. Backcountry grouse tend to be rather trusting, and with meat acquisition during trips the name of the game, rather than wingshooting, a much smaller and lighter gun is desirable. I settled on the Rossi Tuffy, with modifications. The Tuffy is a singleshot .410 meant for children, as evidenced by the very short stock (black, at top). This makes it unusable as a traditional long gun for anyone over 4.5 feet tall, and obviously needed to be changed. 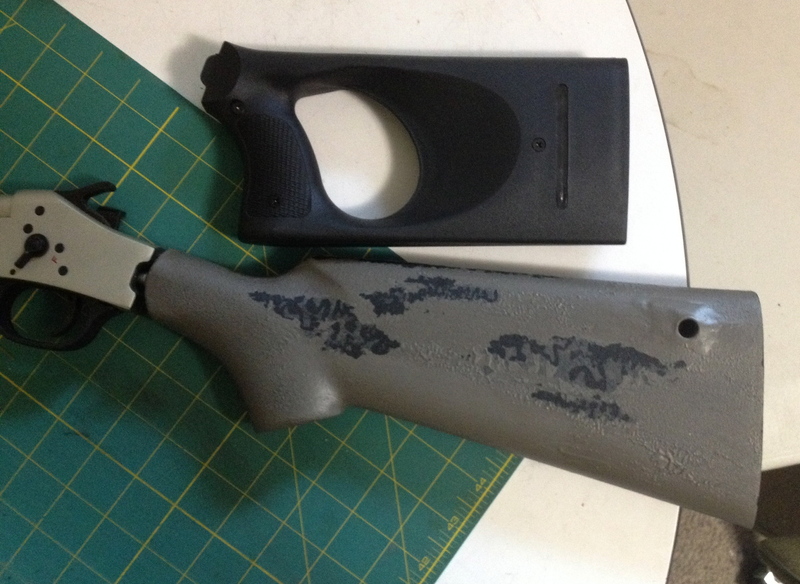 We recently updated the furniture on M’s .243 Handi-rifle, so the plastic H&R stock was available for modification. This is the one made by Choate which is widely available for around 35 dollars. The Tuffy stock is split laterally, and attaches to a pistol-gripesque metal protrusion which bolts into the back of the receiver in much the same way as stocks attach to Handi-rifles. Fitting the H&R stock to the Tuffy was a matter of sourcing a longer bolt in the correct, smaller diameter, and grinding the H&R stock to fit. Above is the stock to receiver interface before any fitting. The plastic is easily shaped with a bench grinder, making this project fairly simple for those with access to that tool. 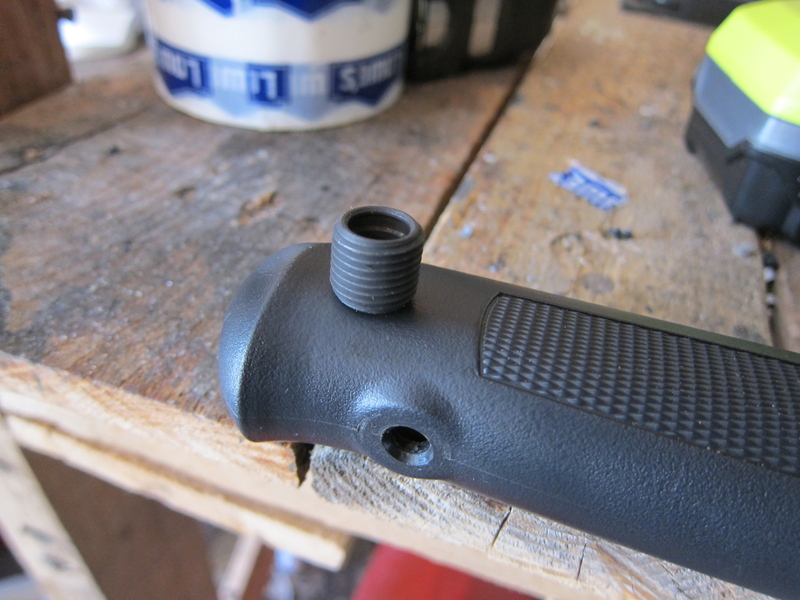 The only hiccup was that said grinding shortened the stock a decent bit, which caused the bolt I purchased (exactly as long as the H&R bolt) to insert far enough that it prevented the hammer from cocking. A few washers in the stock took care of that, but you might want to buy a bolt 5-8mm shorter than the H&R, and have a few washers on hand just in case. After the fit is satisfactory, install the bolt with plenty of locktite and a bit of silicone caulk in between the stock and receiver to seal out water. The result is a 3.5 pound shotgun with a 33 inch overall length, 13.5ish length of pull, and a 18.5 inch barrel with a modified choke. Additional modifications consisted of installing flush mount swivel cups in the furniture, and painting it with field drab Aerove paint. Side mounted swivel cups make for a slick facade and comfortable across-the-back carry with a sling. I like these steel ones made by Grov-Tec. You’ll need a 1/2″ forstner bit and a 9/16″ 18 tpi tap, plus a bit of JB Weld on the threads for extra security. Why the Tuffy? It is a lighter, shorter, slimmer, and cheaper option than anything other than a pistol. H&R .410s are built on a much beefier frame and weigh almost twice as much. The various small .22 rifles are more expensive and less versatile, though they would have a longer effective range. Pistols are also more expensive, and while much more compact I’m not a practiced pistol marksman, and have enough hobbies to cultivate as is. The Tuffy patterns well enough out to 30 yards, with a variety of loads, to be perfectly adequate for picking off hares and knocking grouse out of trees. It’s a joy to carry, and in this modified incarnation, fun and easy to shoot. With slugs it would probably even get the job done on whitetails in the no-rifle zones close to home. Most importantly, it was an enjoyable project. 12/2016 update: The Tuffy has been a reliable squirrel, grouse, and at closer ranges rabbit slayer for years now. 410 ammo has definite limitations, but so long as those are respected this singleshot is a great tool. Broken down I’ve put it inside my pack, and even inside my packraft. The stock mod has held utterly solid since day one. Too bad Rossi doesn’t make a 28-ga that I can tell. H&R does, but is heavier, as you say. 28-ga actually casts a pattern. Apparently .410 only throws a string. So stepping up to 28 would do all kinds of good things. But .410 is what has caught on despite nil efficiency. Funny. Well, a challenge is fun, but so are relaible results. My uncle preferred .410 for duck hunting (and your grouse) but he admired the 28 as well. A short takedown 28 would be something as a pack-gun. My girl cousin shot her first deer with a 28 slug out of some pretty little autoloader. .410 patterns, it’s just a thin pattern past 30 yards. 28 gauge would be nice, but you get into heavier ammo and a at least marginally heavier receiver. No free lunch. 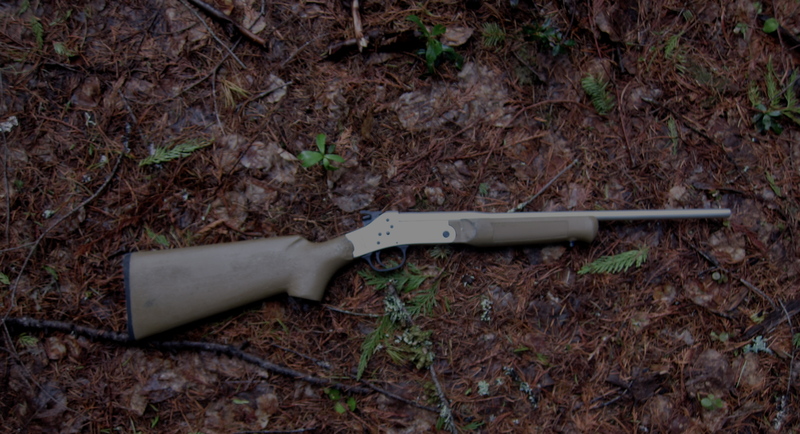 My dream rig is a Blaser in 16 gauge and 6.5 swede. The Savage 24 has been tempting me for decades as a pack-gun. Pick your combo. (.22 mag / 20 ga seems awful nice.) It’s just that in our downstate Michigan world I haven’t actually needed a rifle and shotgun on the same day yet. Up north would’ve been a different story. This is a very interesting idea. I have reached the age where I can no longer use iron sights effectively and must use a rifle scope. I might get by with a peep sight, but it needs to be at close range. I was out squirrel hunting some time ago with a scoped 22. It was so humid that my scope kept fogging up and I couldn’t see the squirrel well enough to take a shot. I began to wish for a small light shotgun that I could take with me for small game. This might be it. The rifle/shotgun combinations don’t appeal to me, unless I could use a removable scope. FYI folks, it seems that Rossi has/is discontinuing the Tuffy, so if you want one get it soon. This guy has proven to be a great small game gun. Dave, I have recently got into shotgun hunting and have a question. What do you do about the plastic wads that fly out of the shell? I hate the idea of them polluting the environment. Not much. You can try to find them, but that rarely works out. So is there really no way to avoid leaving pieces of plastic in the environment while shotgun hunting? I’m not sure if I feel comfortable using a shotgun if that’s the case. You’re scattering either lead or steel all over as well. Presumably back in the day paper was used for wadding rather than plastic. If you reloaded you might be able to do that. Small scale littering. The extent you’re ok with that you’ll have to decide for yourself. I stumbled across this article when I was looking at the tuffy as a truck, backpack type gun to replace a very old H&R 410 that I foolishly traded away many years ago. It was lighter and slimmer than the modern versions. I was thinking that the tuffy would be light enough for what I was looking for but that short stock wouldn’t cut it. I did a search for stocks for the tuffy and found this, I’m heading to my LGS tomorrow to order the gun and Choate has the stocks online. Enjoy Andrew. I use the heck out of the Tuffy for grouse and squirrels. It’s a fun tool. 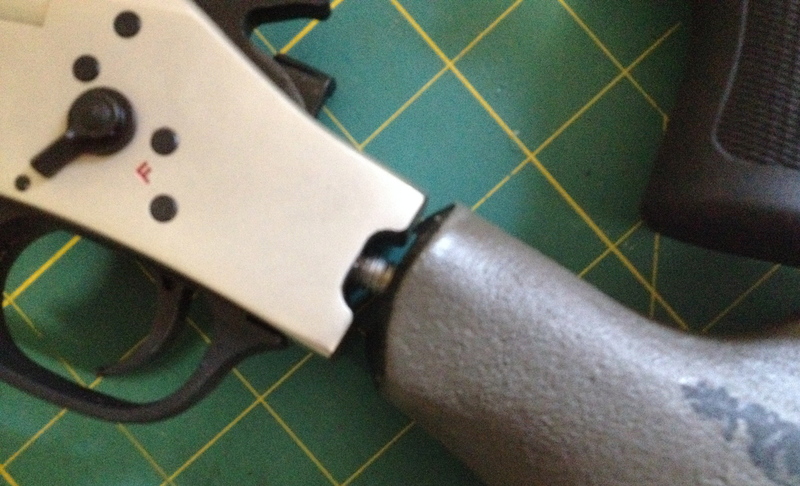 It’s held up well over the years, and the plastic stock can be modified easily. I want to try the same thing but with the survivor stock.